Near by pay and display car park. Good free on street parking. Our first floor private room overlooks the Market Square in one direction and our garden in the other. The room, with its oval table, can hold up 12 guests and adapts extremely well for both business meetings and private parties. The room is equipped with WiFi and a 40” HD flat-screen TV: ideal for Power-Point presentations as well as sporting events. 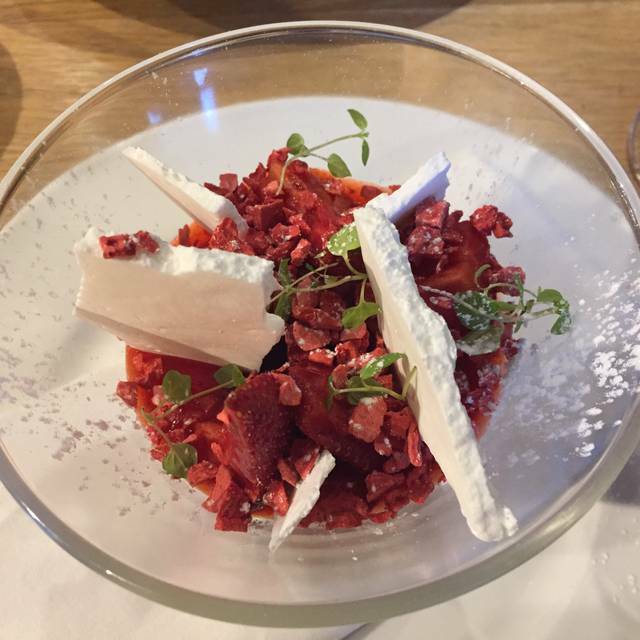 Situated in the beautiful 17th Century former grammar school building in the heart of the historic Chiltern’s market town, Gilbey’s Old Amersham is open every day from 12.00 noon for lunch and from 6.45pm for dinner but nb we are closed on Sunday evenings. 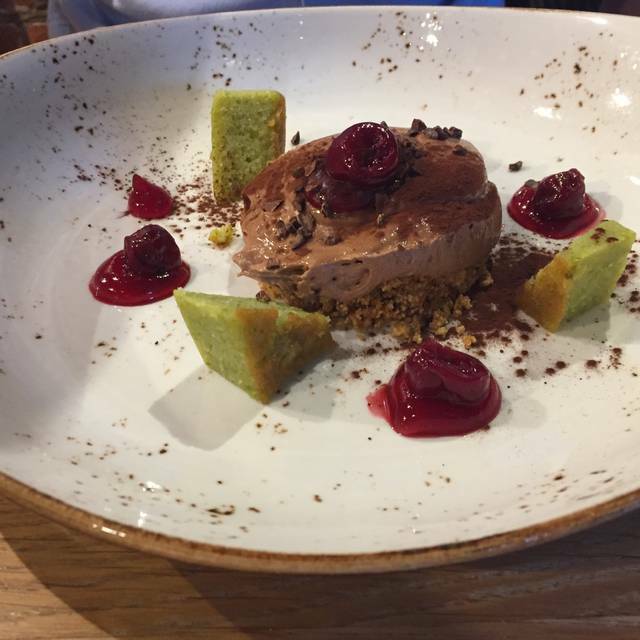 My daughter and I had a very enjoyable meal at Gilbey's Old Amersham to celebrate my birthday. We both had the lunch-time menu which we felt was good value for the quality of the food. The celeriac soup was delicious and it looked so appetising when served and it was very hot. Gilbey's fish and chips served with peas three different ways was also delicious and very appetising. The service was excellent. The building is very attractive and has a lovely atmosphere. We enjoyed our visit so much that I made another booking for next week! Lovely restaurant. Staff excellent. Food really tasty and great value if you get the set menu. highly recommended. One of our favourite restaurants. Always great food and service. Very good fixed price lunch. I had the roasted carrot salad which was absolutely delicious ,with the chicken supreme to follow. Succulent and full of flavour. Will definitely go back soon. A very enjoyable evening. A cosy restaurant with a lovely ambience. Music in background just right, not too loud or quiet. Food is delicious and well presented. Could do with slightly bigger portions especially considering the prices. Not the most expensive restaurant around, but I think a lot of people would like a bit more for their money. Serving staff friendly and informative. I was recommended the Sea bream, will definitely have again - delicious. We will be back soon, definitely recommend. The waitress we had on the day was really great. We love this restaurant. Refurbishment a missed opportunity. Tables too small and cramped. Food ok but nothing special. Bit pricey in my opinion. The food is amazing and there is absolutely no time pressure at all. Always a delightful experience. I like the changing menus but unchanging top quality service and ambience. Redecoration lovely. Wouldn’t recommend on the visit but the previous 4/5 have been really good so may have been an off day. Service was slow unfortunately waited 30 mins for the starters which when arrived were very good (duck parfait, crispy squid and prawns) the another long wait. The table opposite and in 15 mins before us and finished starters after us yet got there main courses, exactly the same as ours 10 mins before ours. The steak was average, tough and fat not rendered down enough and my partners lamb wasn’t as good as previous lamb dishes on other visits. The lamb was tough a small portion and comes with a strange smoked sausage which doesn’t go with the dish. All plates will cleared pretty swiftly then we were given desert menus, we decided to have some and a couple more drinks but no one came to take an order and we sat there for over 20 mins waiting, no staff walked past to ask so when one finally arrived we just got the bill. Paid and left, no one said bye/thabks and had to get the coats ourselves. Sat down at 8 pm and left after 10pm having only had 2 courses. Not a great visit but as said before all other trips here have been good. We went here for Valentine’s Day and it was lovely in every way. Food was delicious and the ambience was romantic and cosy. Good value for money will definitely go again. This restaurant is cosy and snug. It is very popular and it was full house when we arrived. Food portion was good. We cousins managed to have any dessert. The only down side was more than an hour wait for the food as they misplaced our order. Drinks were on the house as the result. Friendly service, delicious food and warm ambience. Really good value lunch at £15 for two courses. Good choice of menu. The mussels were amongst the best i have enjoyed and their fish and chips are outstanding. Even better since refurbishment. On this occasion I was disappointed and probably will not return. I have eaten here a number of times and this is the first time since their refurbishment. Three out of four mains and two starters were not hot they were borderline on warranting a complaint, I chose not to because I didn't want to ruin our meal. My pet hate is warm food. I wondered if the food had been left on the pass too long awaiting service. The vegetables in the main courses seemed to be minimalist to the point they were nearly missing.The service as always is unobtrusive, the drinks order was forgotten twice however. The wine choice is very good, but overall a disappointing experience. Always a great meal and we loved the new decor. Well worth a visit. It was our sons birthday, which despite telling them beforehand, they ignored. You are punished for not ordering a starter as they tell you it will be half an hour for the main course as it has to be freshly cooked (I think we would expect that given it’s a restaurant!) - one hour later we were still waiting! We ordered “a mixture of breads and butter” to share - this was 4 half slices of white bread so we asked if we could have some brown bread as well and were told they didn’t have any - disgraceful. We sat down at our table at 8:30 and our meal was served at 9:45. The waitress is another story... rude and aggressive. This place is not cheap, so do yourself a favour, book somewhere else for a far better dining experience! Another lovely meal at Gilbey's. We were in private dining room, so once we worked out how to turn down the piped music it was excellent. Although upstairs, we were still well looked after although one member of staff was not very knowledgeable or helpful - perhaps she was new. The others were lovely though. We had a quiet and relaxing evening undisturbed by other diners, and could eat and chat at our own pace. We have always enjoyed our meals until this time. We were offered the worst table and after refusing twice and being told that was the only table available they then found table 17 which was ok. The better table opposite stayed empty all evening as the diners had apparently cancelled and in any event the restaurant ess not busy as usual. 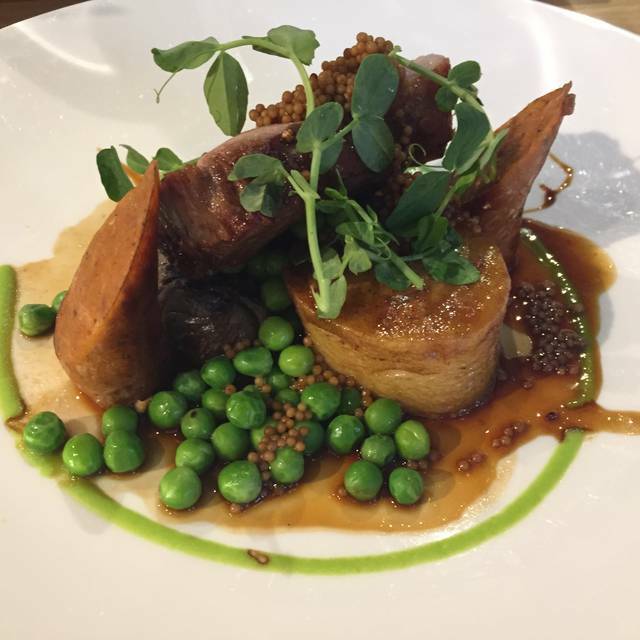 The Sunday Lunch is consistently delicious, the staff friendly and helpful, and we love the new décor following the refurb! Excellent pre Christmas meal with my son and his partner.The food was very good ,we all enjoyed the pumpkin soup.The waitress was very pleasant,all in all an enjoyable experience. Had a lovely lunch with colleagues from work. Set menu good value at £20 for 3 courses but watch all the extra costs such as upgrading to fat chips or ordering bread to go with the half piece that came with the soup! Gilbey's is in a perfect location in Old Amersham. The restaurant is charming and they have a great set menu for lunch. I would recommend for a lunch with friends. I enjoyed the fish and chips as my main. The portion size was perfect for lunch and very well presented with fries and peas. 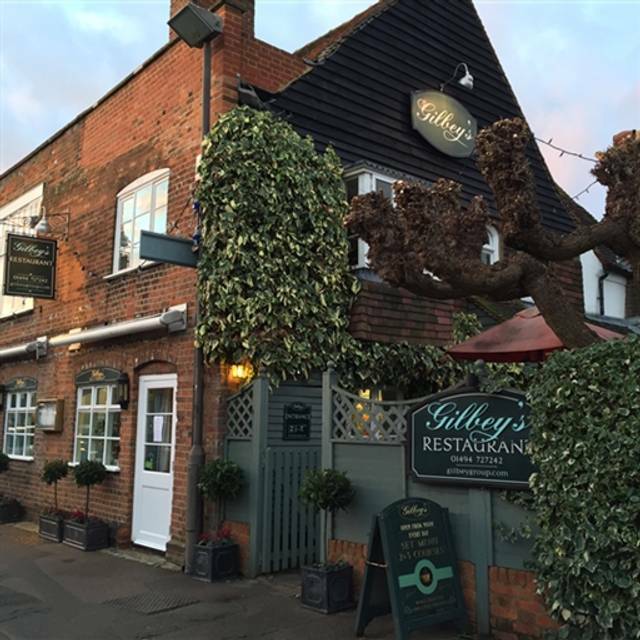 Gilbey's in Old Amersham is an excellent restaurant, our food was delicious, nothing was rushed, the staff were attentive and polite without being everpresent. The wine list is good and not overpriced. There is a half-price wine deal on Wednesdays which was of interest. Very pleasant and relaxed setting. Unfortunately a bit noisy with groups due to time of year. Very good quality food, tasty and well presented . Service prompt friendly and efficient. Would definitely revisit in the near future. Establishment would benefit from better wash room facility. Went for lunch with my partner for a celebration. Their 2 or 3 course set menu was terrific value. Lovely food. Quiet polite service, efficiently executed. Will definitely return. Very nice Sunday lunch with good food and service. We had a dish not on the menu specially requested. Had to wait a bit to pay the bill and also to get out costs but that was a trivial matter overall very much recommended. We had a delightful meal. The food was full of flavour well seasoned and presented well. Excellent food and value from the set menu. Quiet and relaxed (Tuesday evening) and excellent, friendly service. 4 of us for lunch. We chose the fixed price lunch and a bottle of Sauvignon. Good value well prepared food. Had a family Sunday lunch at Gilbey's which we hadn't been to before. Pretty building in Old Amersham and prettily decorated inside too. We were the first ones there as our booking was for 1200, nothing else available. This was fine as by the time we'd had a drink and ordered it was about 1230 and was really starting to fill up. We all had the roast beef which was cooked beautifully (may be an advantage of being there early!) It was just the right thickness, lovely and pink and two good slices. The yorkshire pud was ok but we were very disappointed with the number of roast potatoes, very tiny and oh, there they are hiding under the yorkshire! Our 28 year old son was most offended and we asked for more and more gravy (his favourite bits of Sunday lunch) which were brought promptly. The flavour of the potatoes and the beef was fabulous, it really tasted like a home cooked Sunday lunch - bit disappointed in the veg though, a couple of green beans, a couple of carrots and something else which I forget. The puds were highly rated by the family, I stupidly opted for cheese, which was nice but the puds were much better. We would definitely go there again - it was heaviing so obviously a great and popular place to visit. Would like to go for dinner next time - oh wine was lovely too! Gilbeys is an excellent smallish restaurant with attractive tables and chairs (cushions provided !). Food and service is excellent friendly but unobtrusive. The weekday set menu offering 3 courses for £20 is very good value in my opinion and no doubt explains why it is highly advisable to book. It was fully occupied at lunchtime yesterday but the staff coped admirably. It is located in Old Amersham which is a lovely old town to walk around. There is also a good public car park Dovecote situated nearby on same side of the road.